This in-depth analysis of the use of unlicensed software shows that companies that implement strong measures to improve the way they manage software now have a powerful new tool for reducing security risks, boosting their bottom line, decreasing downtime, and growing opportunity. Use of unlicensed software, while down slightly, is still widespread. Unlicensed software is still used around the globe at alarming rates, accounting for 37 percent of software installed on personal computers – only a 2 percent drop from 2016. CIOs report unlicensed software is increasingly risky and expensive. Malware from unlicensed software costs companies worldwide nearly $359 billion a year. CIOs report that avoiding data hacks and other security threats from malware is the number one reason for ensuring their networks are fully licensed. 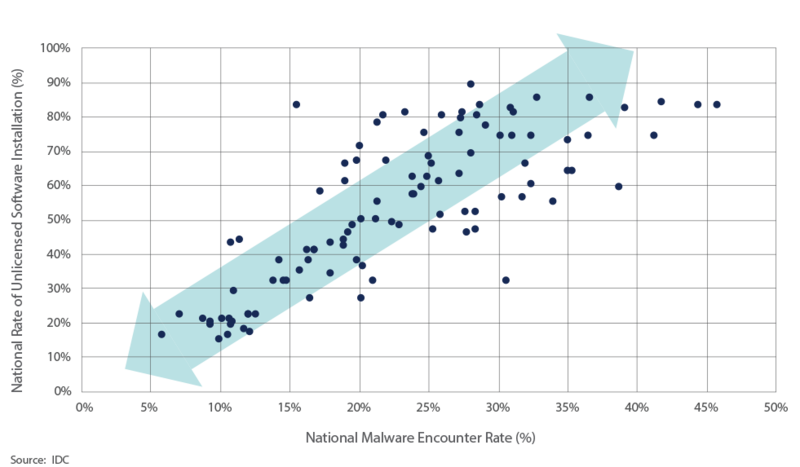 Improving software compliance is now an economic enabler in addition to a security imperative. When companies take pragmatic steps to enhance their software management, they can increase profits by as much as 11 percent. Organizations can take meaningful steps today to improve software management. Studies show that organizations can achieve as much as 30 percent savings in annual software costs by implementing a robust SAM and software license optimization program. Organizations now face a nearly one-in-three chance of encountering malware when they obtain or install unlicensed software. Dealing with the malware associated with unlicensed software can cost more than $10,000 per infected computer for a worldwide total of more than $359 billion. Users are taking note: 68 percent of computer users and 48 percent of CIOs rated malware among the top three reasons not to use unlicensed software. CIOs top concerns from these unlicensed malware threats includes the loss of corporate or personal data, system downtime, network outages, and the cost of disinfecting systems. To help mitigate these impacts, the number of CIOs who have a formal written policy about the use of licensed software has jumped dramatically from 41 percent in 2015 to 54 percent this year. Yet only 35 percent of workers are aware of a formal written policy, suggesting a critical education gap. Organizations taking proactive steps are finding that a 20 percent increase in software compliance can improve a company’s profits by 11 percent — a boost of more than half a million dollars for the average-sized company in the survey. BSA’s Global Software Survey conducted in partnership with IDC, estimates the volume and value of unlicensed software installed on personal computers in 2017, across more than 110 national and regional economies. It also reveals key attitudes and behaviors related to software licensing, intellectual property, and emerging technologies based on a global survey of more than 20,000 respondents. 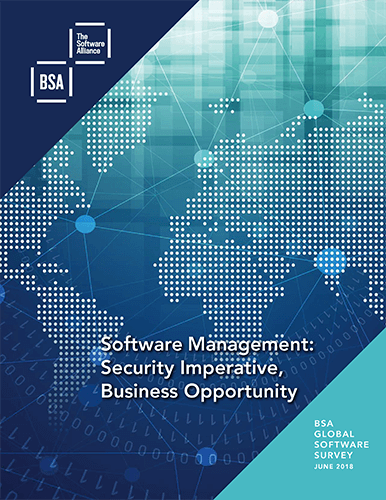 BSA | The Software Alliance is the leading advocate for the global software industry before governments and in the international marketplace. Its members are among the world’s most innovative companies, creating software solutions that spark the economy and improve modern life.